This outstanding pool home is located in the subdivision of Woodbridge. The neighborhood is not gated but offers mild deed restrictions with a tidy look & feel. his three bedroom, two bath home is located on a quiet street. At the entry you greeted by charming front porch that is perfect for a glider swing or a few chairs. Interior features include offered ceilings with detailed millwork, crown molding and built in plant shelves. The kitchen is spacious with great architectural details that perfectly frame the built in cooktop. This home has the popular great room floor plan & split bedrooms. There's a perfect view of the pool to enjoy over morning coffee from the dining room with build in buffet area that features additional cabinets for storage & a wine rack. Under cabinet lighting highlights the uniqueness of the kitchen and dining areas. 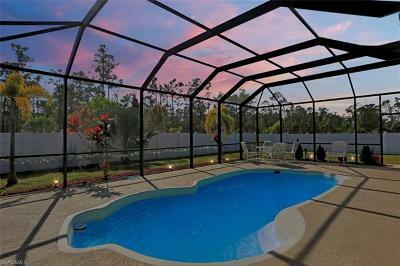 The swimming pool area has a screened enclosure and an unusually spacious covered lanai area with a view of the privacy fenced back yard. It’s a pet lover’s dream. Woodbridge is located near the former Bonita Golf & Country Club, less than 20 minutes to gulf beaches, minutes to Coconut Point & less than 30 min to RSW airport. Super low HOA!